Zackary and I headed out on a one-hour trail ride and I was actually rather impressed by how much he enjoyed the ride. An hour is a long time to stay in the saddle for a novice rider but holding the reigns, directing his horse and following the tracks kept him interested the entire time. Meanwhile, I loved getting up close to the beautiful scenery and enjoying the warm summer sunshine. 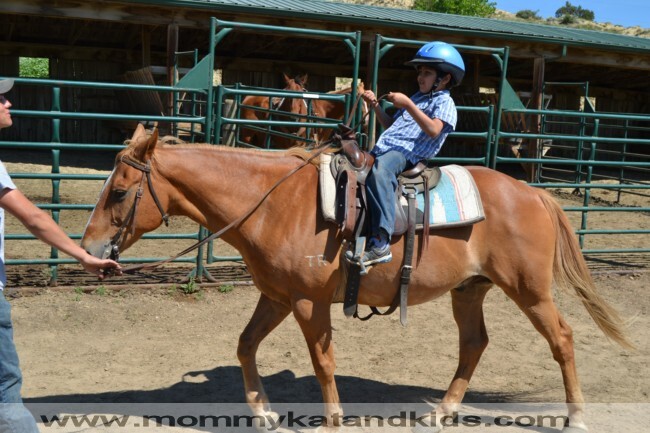 This is definitely an activity that adults and children will both love and a great first introduction to riding a horse! 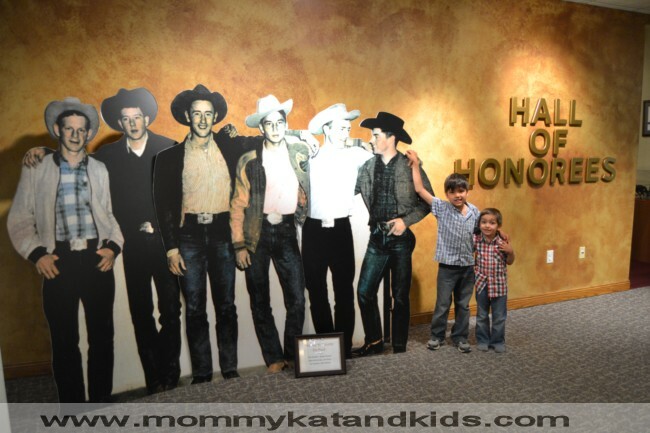 The ND Cowboy Hall of Fame features a 15,000 square-foot interpretive centre that celebrates the cowboy way of life. 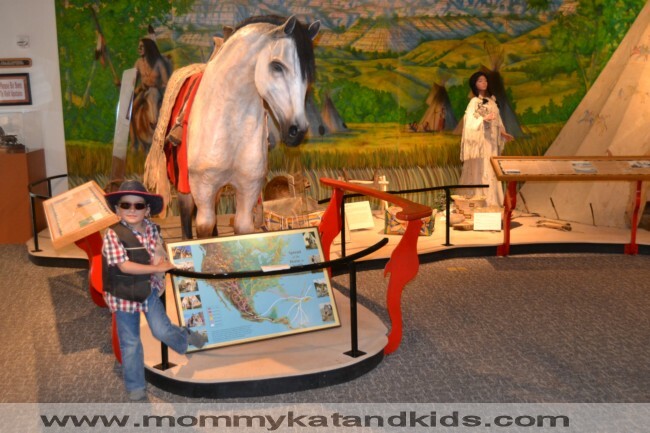 With a theatre featuring a quick movie about North Dakota’s cowboy history, beautiful displays of authentic artifacts and a fun hands-on section for kids, there’s plenty of information and entertainment in this building! Coming from a province with a strong Western heritage myself, I loved seeing some of the awards and props used in the old rodeos. A barrel used by the Rodeo Clowns had me especially captivated; I had no idea the inside of the huge, heavy barrel had been so carefully padded but considering its purpose, it made sense that it would be! The upper floor of the building contained the Hall of Honorees and the boys were so inspired by the awards that they decided to become informal members of the famed North Dakota Six-Pack! A trip to the gift shop finished off our adventure; a visit to Medora wouldn’t be complete without some fun cowboy gear for the kids! The Chateau de Mores is one of only three mansions on the American prairies and was built by the Marquis de Mores for his wife Medora, for whom the town is named. 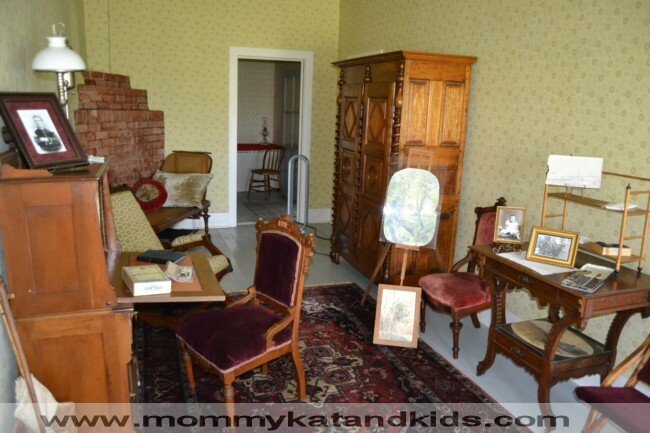 The 26-room house was built as a summer residence for the Marquis and his family and features many of the original furnishings and personal effects of its original inhabitants. Exploring the house was fascinating and it was interesting to see how small some of the bedrooms were by today’s standards considering the house itself is so large. The bedroom and study of the Marquis’ wife were especially interesting as they contained original paintings done by the Marquise and sheet music she had once played on the piano. 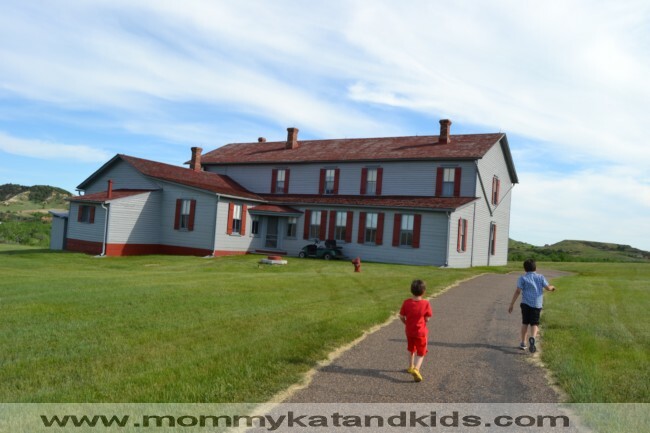 While children may find the tour a little dull, it’s well worth visiting regardless to get a feel for the opulence that some enjoyed on the prairies in 1883. 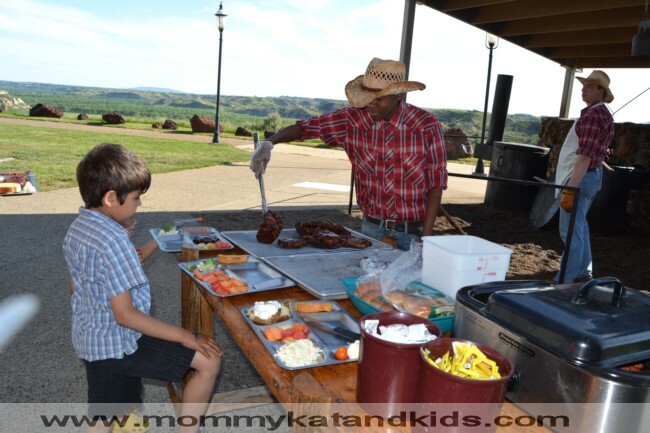 One of Medora’s most popular food experiences is the famed Pitchfork Steak Fondue and I was so excited to attend the event with the boys. 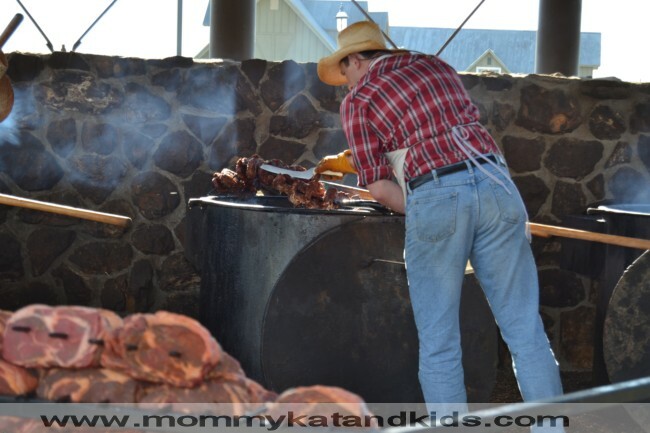 Steaks are speared on pitchforks, dipped in large cauldrons of boiling oil and fried up cowboy-style for a meal that’s as unique as it is delicious. We loaded our trays with all the fixings and then headed over to get our steaks. These cooks know what they’re doing; the steaks had a delicious crispy exterior and were cooked to a perfect pink medium on the inside. The frying process means that the juices stay inside instead of cooking out, resulting in meat that’s incredibly tender. 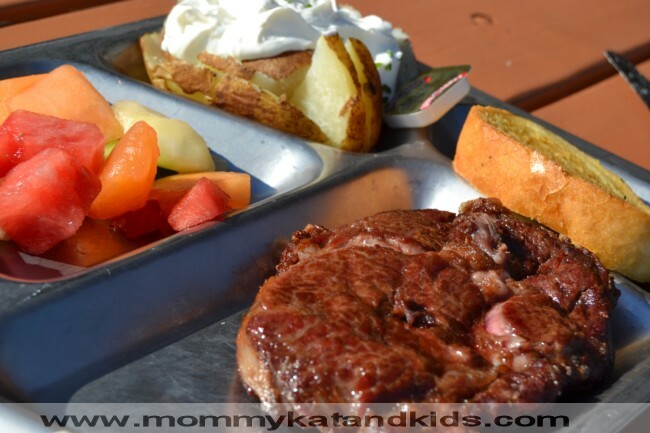 And the scenery alone while eating atop a bluff on the Tjaden Terrace makes this meal a must when visiting Medora! 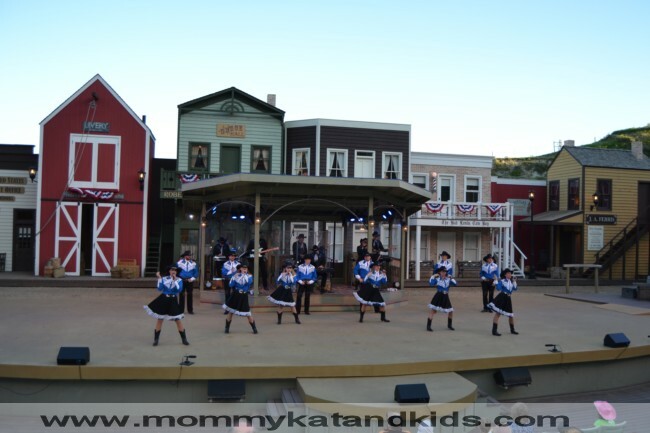 A long-time seasonal highlight when visiting Medora is the Medora Musical, a family-friendly variety show that has been a favourite attraction in Medora for over fifty years. With music by the Coal Diggers Band and singing and dancing by the Burning Hills Singers, the show pays tribute to Teddy Roosevelt and the time he spent in North Dakota. I wasn’t sure what to expect when we sat down to watch the show, but within minutes I was caught up in the fun. 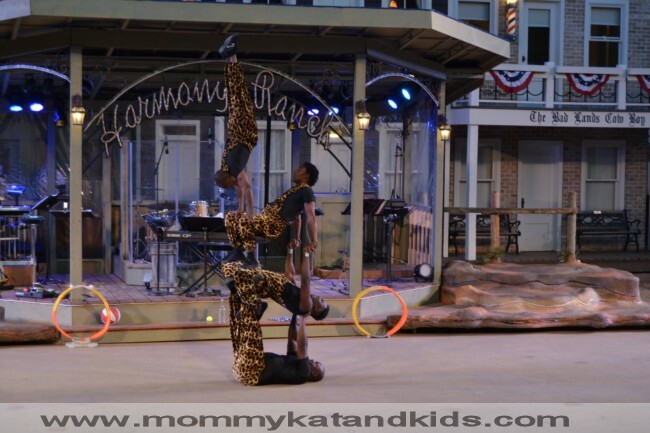 The show kicks off with an invitation for the children to join the performers on stage and take part in a flag-raising ceremony. Then the first half of the show features performances of top country songs from the last 50 years as the Medora Musical celebrates its history. 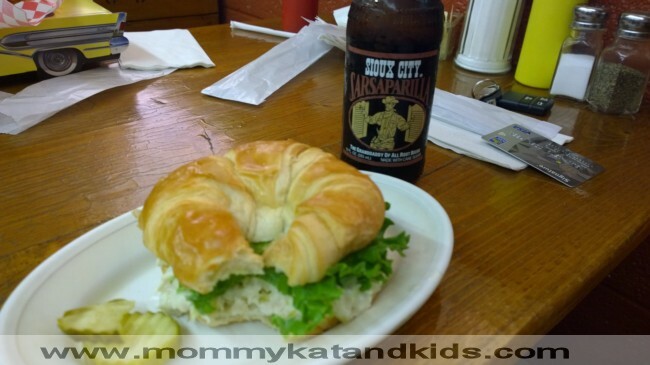 While in Medora, there are plenty of great choices for food and lodging, and we had the chance to experience quite a few of them. 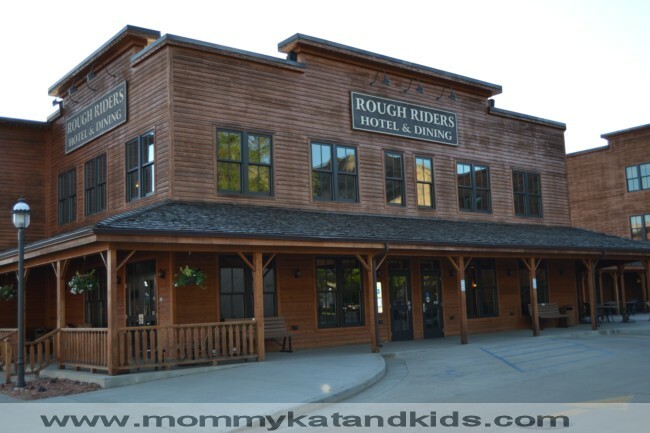 The gorgeous Rough Riders Hotel is a top choice with visitors for good reason. The hotel manages to feel incredibly opulent while still fitting the Old West style of the town perfectly. 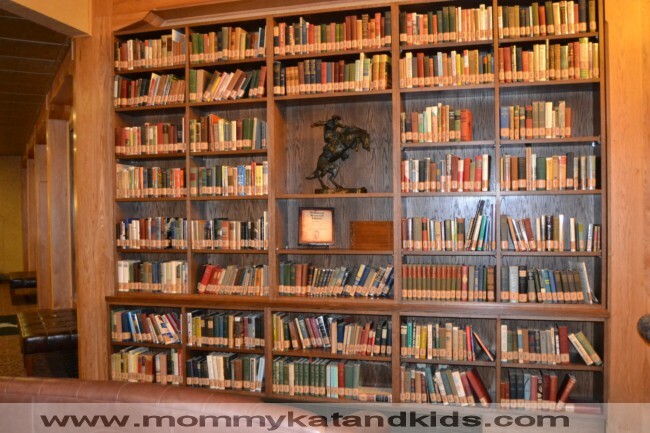 The Wilkinson Roosevelt Library in the lobby was especially impressive, featuring a stunning collection of books about the United States’ 26th president. And when it was time to eat, choices ranged from the hearty and filling buffet fare at the Chuckwagon Buffet to the old-time country cooking of the Cowboy Café to the grilled goodness of Boots Bar & Grill. 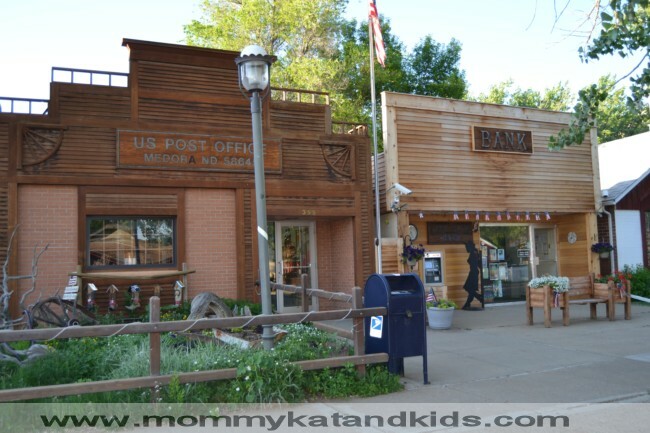 And a trip to the Medora Fudge and Ice Cream Depot for some ice cream or homemade fudge is a must when visiting Medora! 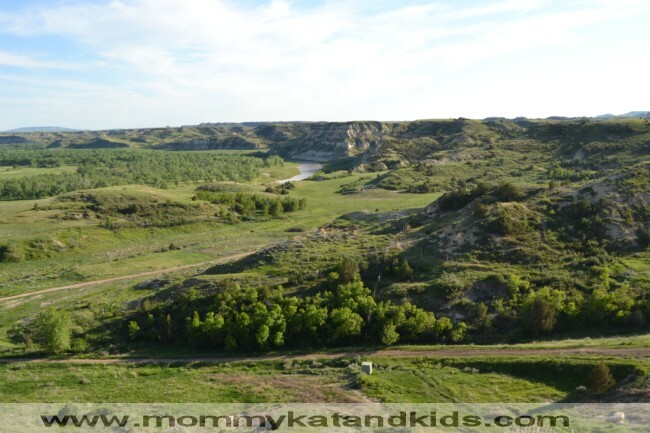 Our trip to Medora was one of those experiences that I know my boys and I will remember for years, both because it was so much fun for all of us and because it was so different from the usual family vacation activities. 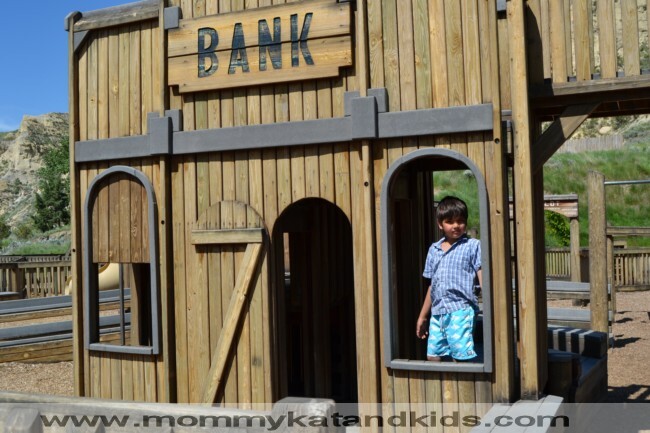 Even shopping for souvenirs and playing at the park was fun and different thanks to the Old West-style of the stores and parks! 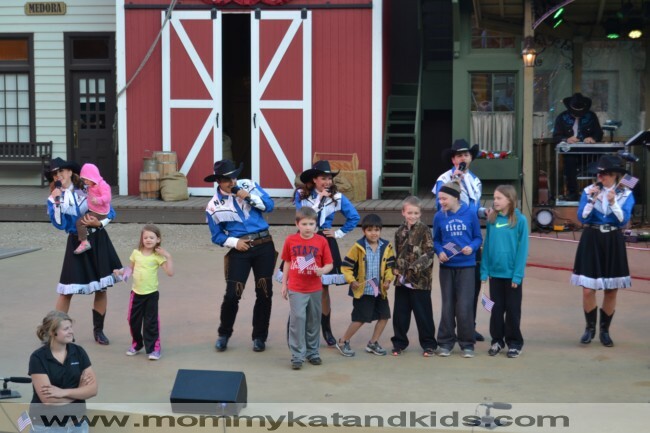 If you’re heading to North Dakota, make sure that you plan an extra day to experience Medora. Living the cowboy life has never been so much fun!